The indirect effect within a food web that has probably received most attention is the so-called trophic cascade (Paine, 1980; Polis et al., 2000). It occurs when a predator reduces the abundance of its prey, and this cascades down to the trophic level below, such that the prey's own resources (typically plants) increase in abundance. Of course, it need not stop there. In a food chain with four links, a top predator may reduce the abundance of an intermediate predator, which may allow the abundance of a herbivore to increase, leading to a decrease in plant abundance. The Great Salt Lake of Utah in the USA provides a natural experiment that illustrates a trophic cascade. 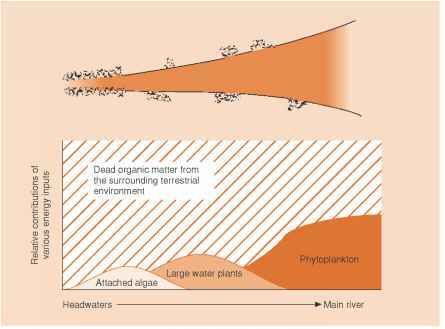 There, what is essentially a two-level trophic system (zooplankton-phytoplankton) is augmented by a third trophic level (a predatory insect, Trichocorixa verticalis) in unusually wet years when salinity is lowered (Wurtsbaugh, 1992). Normally, the zooplankton, dominated by a brine shrimp (Artemiafranciscana), are capable of keeping phyto-plankton biomass at a low level, producing high water clarity. But when salinity declined from above 100 g l-1 to 50 g l-1 in 1985, Trichochorixa invaded and Artemia biomass was reduced from 720 to 2 mg m-3, leading to a massive increase in the abundance of phytoplankton, a 20-fold increase in chlorophyll a concentration and a fourfold decrease in water clarity (Figure 20.2). Another example of a trophic cascade, but also of the complexity of indirect effects, is provided by a 2-year experiment in which bird predation pressure was manipulated in an intertidal community on the northwest coast of the USA, in order to determine the effects of the birds on three limpet species (prey) and their algal food (Wootton, 1992). Glaucous-winged gulls (Larus glaucescens) and oystercatchers (Haematopus bachmani) were excluded by means of wire cages from large areas (each 10 m2) in which limpets were common. Overall, limpet biomass was much lower in the presence of birds, and the effects of bird predation cascaded down to the plant trophic level, because grazing pressure on the fleshy algae was reduced. In addition, the birds freed up space for algal colonization through the removal of barnacles (Figure 20.3). It also became evident, however, that while birds reduced the abundance of one of the limpet species, Lottia digitalis, as might have been expected, they increased the abundance of a second limpet species (L. strigatella) and had no effect on the third, L. pelta. The reasons are complex and go well beyond the direct effects of consumption of limpets. L. digitalis, a light-colored limpet, tends to occur on light-colored goose barnacles (Pollicipes polymerus), whilst dark L. pelta occurs primarily on dark Californian mussels (Mytilus californianus). Both limpets show strong habitat selection for these cryptic locations. Predation by gulls reduced the area covered by goose barnacles (to the detriment of L. digitalis), leading through competitive release to an increase in the area covered by mussels (benefiting L. pelta). The third species, L. strigatella, is competitively inferior to the others and increased in density because of competitive release.